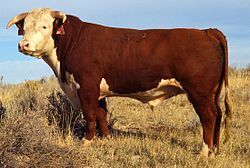 Hereford cattle are a widely used breed in temperate areas, mainly for beef production. Originally from Herefordshire, England, they are found in the temperate parts of Australia. The breed also enjoys great popularity among ranchers in the desert American Southwest of the United States, as well as in the centre and east of Argentina and in Uruguay. Herefords made up the largest percentage of registered cows among herders in New Zealand. This is a testament to the hardiness of the breed; while originating in cool, moist Britain, they have thrived in much harsher climates. The breed has adapted to a wide range of climates on nearly every continent. Hornless variants with the polled gene are known as the Polled Herefords. Breeding horned and hornless together functions as a genetic dehorner. This is often used as an alternative to a dehorning process, which causes stress and often weight loss. ↑ Breeds of Livestock - Cattle. Retrieved 22, April 2008. ↑ Beef New Zealand. Retrieved 22 April 2008. Wikimedia Commons has media related to Hereford (cattle). This page was last changed on 25 September 2014, at 13:01.